Join the discussion on our forums! Come discuss Primalfin Lookout over in our dedicated Primalfin Lookout discussion topic. Is he saying: "DO YOU REMEMBER? ", in the 'play' sound? You guys ready for murloc-ception with this card? Infinite Murloc value, hell yeah. Just like the 1/1 Murloc spawned from Murloc Tidehunter, Megafin is a Token card, which means you cannot get it from anything but the Murloc quest. I think this card isn't as good as people seem to think on initial impression. The battlecry is clearly great, but Murlocs can ill afford to lose tempo like this. 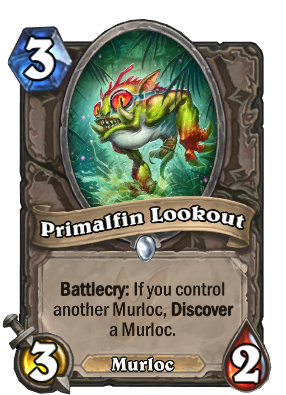 On turn 3, assuming you already have a murloc down, it's hard to imagine wanting to drop this guy and lose what initiative you have already by playing something that trades down to Mistress of Mixtures. Time will tell I suppose, but I don't find him terribly exciting. Great Point! Buuut, I think that this goes really nicely into a control murloc shaman archetype providing 2 cards for 3 cards worth of value for the quest. Combining this with all of shamans nice removal, you dont have to play many murlocs because of this card and call in the finishers (Maybe warleaders too). While linking the good removal and the shamans new quest, that could provide a strong midrangy/control deck with murlocs. Really nice Murloc card. Gorillabot saw play before Naxx and GvG rotated out, and it's easier to spam Murlocs than it is to spam Mechs. So alltogether, we only have 1 or 2 actually bad outcomes to discover, which means there will be always at least one pick that at lesat might be coming handy as the game goes along, while in the best case scenario you can get an additional lookout for discover or a finja to advance the board even further or just the classic Warleader. For Wild players the list is slighty different, but the Idea is still the same.